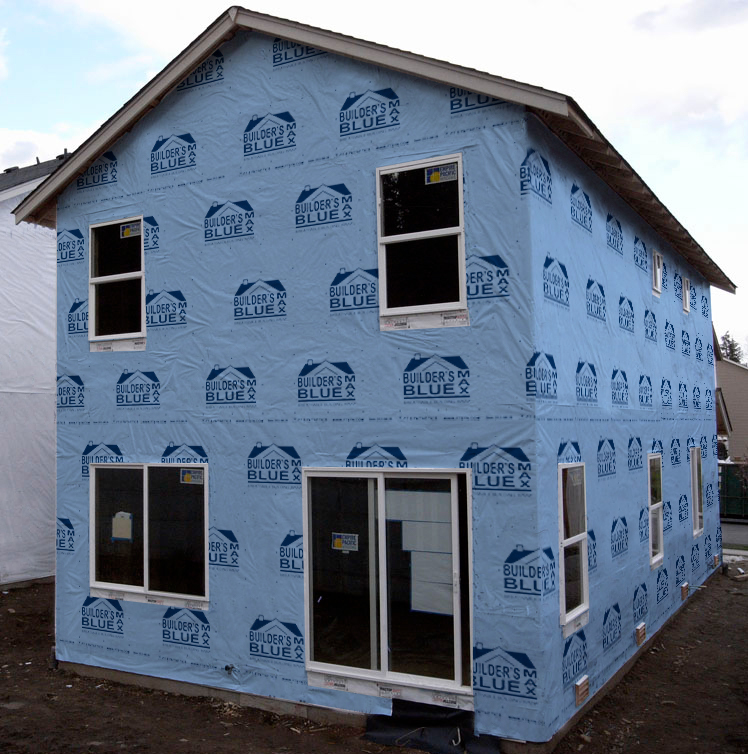 Builder’s Blue™ MAX is a nonwoven building wrap designed with a unique membrane coating to provide outstanding vapor permeability and air barrier properties using an advanced chemical transfer of water vapor. Builder’s Blue MAX wrap is designed for both commercial and residential applications. Builder’s Blue MAX meets and exceeds all current building codes for a water resistive barrier. Builder’s Blue MAX features a non-perforated non-microporous, scientifically advanced monolithic membrane technology designed to ensure optimal breathability to allow water vapor trapped in the wall cavity to escape promoting drying and decreasing the risks of mold, mildew or water damage. In addition, this monolithic membrane acts as an air barrier protecting against air penetration and ensures your building will experience increased energy efficiency. Builder’s Blue MAX, with its advanced monolithic membrane technology, allows water vapor molecules to escape while simultaneously blocking all liquid water even when exposed to surfactants such as soaps, oils and tannins from wood, and bonding agents used with stucco. Building wraps that rely on perforated or microporous properties to achieve breathability can fail and allow for the leakage of water when exposed to these chemicals. Builder’s Blue MAX has both higher tear resistance and elongation as compared to other building wraps, to ensure that it stays in place on the structure until the final covering is installed. Builder’s Blue MAX has a semi-transparent design that also allows for it to easily line up on wall studs, and easy locating of openings and corners. Builder’s Blue MAX is manufactured with UV inhibitors that allow for up to 180 days of exposure while providing full protection as a weather barrier. FT Synthetics Builders Blue™ can be installed over an approved exterior sheathing or directly to framing members. Make sure to install the printed side of Builders Blue™ is facing outward. Begin by aligning the roll plumb to wall. Bottom edge must extend a minimum of 1” (25 mm) over the sill plate, 2-4” (50-100 mm) preferred. Start approximately 2 feet (60 cm) from a corner of building and fastening securely to the stud or other structural sheathing. Use fasteners (plastic cap nails or plastic cap staples) that are long enough to penetrate stud or base material. Fasten every 12” (30 cm) on vertical stud lines. Continue to unroll FT Synthetics Builders Blue™ with print side out and wrap entire building, including door and window opens fastening on the vertical stud lines as you proceed. All vertical and horizontal overlaps should be a minimum of 6 inches (15 cm). For proper water management, lap all components starting from the bottom of the wall to the top of the wall, treating the wall of the building like a roof. For use as an air barrier all seams must be taped with a good quality construction tape. For instructions on openings, see Window and Door Preparations. Take advantage of low-cost marketing with our Builder’s Blue Dual Logo Program and receive majority branding alongside our own logo and contact information. You’ll be recognized in the community as a leader in sustainable roofing practices and gain valuable exposure for your business.